As we mentioned earlier, the East Side Riders Bike Club is working with adaptive bikemaker Buddy Bike to buy one of their bikes for special needs kids. The company is offering a tandem Buddy Bike, which normally sells for around $1,700, to the East Side Riders for just $900. The Buddy Bike allows riders with disabilities to experience the thrill of riding a bicycle with the whole family – or in this case their community. A Buddy Bike would be helpful for any riders in the club with special needs or for some of the new riders who aren’t comfortable riding on their own yet. The Buddy Bike can help riders of all ages to learn cycling skills while keeping up with the crew. 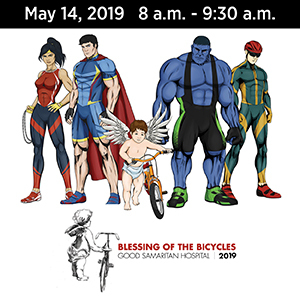 You can also contribute through the ESRBC GoFundMe page by specifying that funds are for the Buddy Bike, since the club is also raising funds for their BEAST bike safety classes. Apparently, the real problem on our streets are that scooters are too damn fast. In an apparent effort to keep the city’s fastest growing form of alternative transportation from spreading, Los Angeles councilmembers seem to be attempting to regulate dockless e-scooters to death. Including a proposal to shave a whole three miles an hour off their top speed, limiting the scooters to just 12 mph. As if that 3 mph will make much of a difference when riding in traffic on 25 mph streets, where scooter users are currently required to ride unless the street has a bike lane. Other that to put them at greater risk from speeding drivers, that is. There may be some limited benefit to lowering speeds, particularly when users illegally ride on sidewalks. But the current panic over scooters is like worrying about squirrels stealing your nuts, when there are tigers roaming the streets. Until the city does something about LA’s notoriously dangerous streets — like slowing traffic, fully implementing Vision Zero and providing the bike lanes we were promised — slowing down scooters isn’t going to make a hell of a lot of difference. A new study confirms exactly what you always suspected. According to the study from the University of Toronto, over half of all drivers failed to look for biked riders and pedestrians before making a right turn. Which explains why bike rider have to dodge right hooks, and pedestrians have to dart out of the way of cars, even in a crosswalk. Confirming once again that you have to watch out for turning drivers, because they sure as hell aren’t watching for us. The penultimate edition of Wolfpack Hustle: The Forsyth Cup 2018 rolls tomorrow at the Encino Velodrome, complete with free hamburgers and hot dogs courtesy of BikinginLA sponsor Thomas Forsyth. Members of my old college fraternity are nearing the end of a 3,000-mile ride across the US; by the time they reach DC, they will have raised over $600,000 for people with disabilities. However, that’s trumped in miles, if not dollars, by a group of riders from the University of Illinois, who’ve raised $110,000 on a 4,750-mile ride from San Francisco to New York. A Playa Vista developer decides to go carfree on the area’s new main shopping street. A pair of off-duty Malibu lifeguards are being hailed as heroes after saving the life of a 76-year old man who suffered a heart attack while riding on PCH. Los Angeles bikebuilder Montenegro Manufacturing celebrates its fifth anniversary by throwing LA County’s first Handmade Bike Show this Sunday. Readers of the San Bernardino Sun complain that the paper, now part of the parent company behind the OC Register and LA Daily News, ignored the Redlands Bicycle Classic in favor of covering more distant beach volleyball. The Daily Bulletin reports on Ontario’s Re-Imagine Downtown event, part of SCAG’s Go Human campaign to show what a bike and pedestrian-friendly Euclid Ave could be. San Rafael is building a $3.3 million bike and pedestrian bridge that will connect the bisected city while improving safety for students at the local high school. Bike Snob reviews a custom bike built four years after WWII. City Lab looks at the history and meaning of ghost bikes. Grist looks at the success of Lime’s Seattle ebike bikeshare system, even if they have to fish them out of the bay. Yes, it still exists, even if kids no longer have to go door-to-door selling subscriptions. A Wisconsin woman is taking on the fight for safer streets as the investigation into the collision that killed her bike-riding husband drags on. Something is seriously wrong in Chicago, where four bike riders have been killed in right hooks by dump truck drivers in less than two years. Indianapolis unveils a two and a half mile long protected cycle track. A DC letter writer responds to a WaPo Op-Ed where a driver said so what if she blocks a bike lane, saying if the city wants to improve safety, they need to keep self-centered drivers like her out of the bike lanes — and off the roads. Baton Rouge LA bike advocates plan to tear down the institutional barriers that keep the city’s streets dangerous. Chances are, nothing has changed from when I lived their decades ago, when most major streets had high speeds, and no sidewalks or shoulders. And drivers weren’t willing to give an inch. Atlanta finds a home for orphaned and abandoned Ofo dockless bikeshare bikes after the company pulled up stakes in the city. A Florida newspaper questions how to improve safety for bicyclists and pedestrians in the most dangerous state for people on foot. A newsmagazine says bikepacking, like life, is about the journey, not the destination. Cycling Weekly looks at what doesn’t work in the rain, including white kits that turn see-through when wet. A contributor to Bike Biz pushes bike shops to be more inclusive for customers with disabilities. Bike riders were the victims of strong arm robberies on an English bike path for the second time in less than a week. For once, a touch of justice from the UK, where a drunk driver gets six years for killing an 82-year old woman as she was riding her bike; he was over three times the legal alcohol limit after downing a full liter of vodka before getting behind the wheel. Welsh police are riding bikes in plainclothes to bust drivers who don’t give riders a safe passing distance. Chinese dockless bikeshare companies are rushing to fill the void as the wheels fall off the Paris Vélib dock share system. Coming soon to a street near you — 30 mph moped-share, already in successful use in Spain. Unless the LA city council gets involved, of course. Take your next bike tour through Italy and the home country of America’s first lady. Austrian cyclist Bernhard Eisel reflects on missing most of the 2018 racing season after he suffered a life-threatening subdural hematoma in a March race. Bicycling calls back-to-back US amateur crit and road race champ Justin Williams the most important cyclist you don’t know, as the African American rider fights for more inclusion in the sport. A Welsh website offers photos from Geraint Thomas’ wild welcome home from his victorious Tour de France campaign. An Aspen bike trail did to Lance what a number of cycling fans probably wished they could. A bike-riding rescue dog becomes an international superstar. And when you wheelie want people to clear out of your way. Somehow bikes always seem to get the blame. Even when they’re nowhere around. In yet another horrible sacrifice to LA’s car culture, a woman and her adult daughter were killed, along with their dog, while attempting to cross Roscoe Blvd in West Hills Monday night. Yet instead of blaming the dangerous drivers who residents say speed through the intersection, the Daily News points the finger at a recent road diet, saying westbound Roscoe was narrowed to provide a buffer for cyclists. That road diet, like every other road diet, was done to slow those speeding drivers and improve safety for everyone. Bike lanes are just a tool to accomplish that; providing a buffer for people on bikes is just an added benefit. Which means the problem isn’t the bike lanes. It’s the culture that says it’s okay to drive 10 miles, or 20, or even 30, above the 40 mph speed limit, then cut over at the last second when the roadway narrows. Police say the driver wasn’t intoxicated, and wasn’t talking on his cell phone. So the question is how fast was he going, why didn’t he see the two women and their Labrador retriever in a zebra crosswalk, and why he couldn’t stop in time. And why in God’s name is a 40 mph speed limit allowed in a residential neighborhood to begin with. There may be a lot of factors that led up to this tragedy. But bike lanes isn’t one of them. 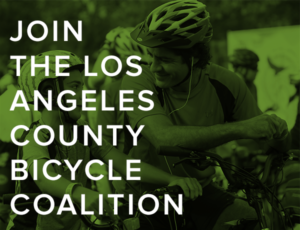 Bicycling Magazine offers a great interview with John Jones III, founder of the East Side Riders bike club, who is using bikes to change Watts for the better. Now we ride through some of the projects, and folks don’t bother us. Some of the people in our club are in gangs, but when we’re on bikes, they get a pass from other gangs because they know we’re doing something good for the community. 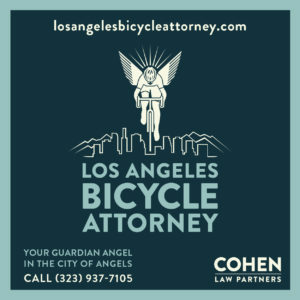 Nice to see one of LA’s unsung bike heroes get the attention he deserves. Beverly Hills, which fought the Purple Line subway extension tooth-and-nail, is now planning an autonomous vehicle program to solve the first mile/last mile problem with a fleet of self-driving cars once it opens in 2026. Never mind that they could solve a lot of that by just putting bike lanes on Santa Monica Blvd. Thanks to John Dammon for the link. Cannondale pro cycling team leader Jonathan Vaughters discusses the future of pro cycling in the US. CNN offers an extensive profile of Lance Armstrong and the movie The Program, calling him a tragic hero. And see the grueling Paris-Roubaix from the cyclists’ perspective. Streetsblog says Metro bikeshare really is coming to DTLA. Meanwhile, West Hollywood wants to know where you’d put stations for their coming system. Downtown News looks at plans for protected bike lanes on Spring and Main in Downtown LA. Pretty Little Liars star Shay Mitchell is one of us, as she tweets about how she loves riding her bike along the beach. St. Vincent Meals on Wheels is hosting their 21st annual Walk/Bike-A-Thon on Sunday the 24th, including a 10 mile ride along the beach to raise funds for Meals for Wheels. Maybe you’ll see Shay Mitchell there. Or maybe not. Concern for equity reaches the state level, as bills in the state legislature would shift priority for transportation funding to disadvantaged communities to ensure everyone has access to safe walking, biking and transit infrastructure. Streetsblog looks at how the San Diego Association of Governments falsely sold a package of highway expansions under the promise of improving the environment, while kicking bike and walking projects down the road. The Voice of San Diego says a recent road diet on the Coast Highway in Oceanside marks the end of the road for the car-only highway. We can only hope. A gofundme account has been established for a Bakersfield 6th grader who was seriously injured in a collision while riding to school on Monday. Classic bicycle fans from 29 countries took part in last weekend’s three-day Eroica California bike fest in Paso Robles. San Francisco Streetsblog asks if new paint and phased traffic signals are enough to keep bike riders safe on a dangerous intersection. A Bay Area website recommends five stunning destinations you can ride to from San Francisco. The San Francisco Bicycle Coalition is looking for a part-time graphic designer. The Atlantic says the absurd primacy of the automobile in American life is insane. A new study from the University of Duh discovers drunk bike riders are more likely to be injured than sober ones. No, really, they needed a study to figure that out. The next time you head to Ikea for a bookshelf, you can pick up a unisex, belt-drive bicycle, too. No word on whether you have to assemble it yourself. Seattle’s Transit Blog tells drivers to relax about cyclists blowing through red lights. Robin Leach, of the Lifestyles of the Rich and Famous fame, calls gambler Dan Bilzerian’s successful $1.2 million bet a “dangerous and nearly impossible ride” through the brutal Mojave desert. Even though countless other cyclists have done it for free. A Chicago couple quit their jobs to travel 4,000 miles across the US on just $6,000. Charleston cyclists call for a trial bike and pedestrian lane over a bridge to be made permanent since it’s the only safe and, so far, legal route over the river; the local paper says so far, so good. 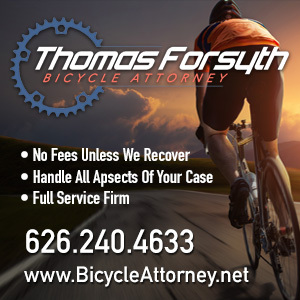 Louisiana considers a vulnerable user law with real teeth, establishing a $2,000 fine and three months in jail for injuring a bicyclist, pedestrian or motorcyclist, and up to $5,000 and five years in prison for killing someone who isn’t in a motor vehicle. The Times recommends a three-day mountain bike, llama and rafting tour of Peru’s Sacred Valley. Modacity’s Chris Bruntlett writes in praise of the upright bike. A Toronto bike blog imagines how treating traffic collisions like we do aircraft or marine disasters, where human life has absolute priority, would change our driving culture. Thanks to Chuck Castillo for the tip. A British opposition MP says there’s a real gap between the government’s words and their actual support for cycling. A Brit woman says she was just driving alone minding her own business, giving a man walking his bike plenty of passing room, when he just randomly picked up his bike and threw it at her car for no apparent reason. Sure, that seems credible. Let’s go with that. Now that’s refreshing. After a London cellist hits a woman riding her bike while on his way to rehearsal — in front of an Aussie actor and recording star, no less — he takes full responsibility and tells other drivers to slow down. Once again, someone has sabotaged a bike trail in the UK, this time stringing fishing line at neck level on a pathway popular with children. A Brit bike rider says today’s focus on sportives, carbon frames and Rapha kits is sucking the life out of cycling. All the world is a bikeway, and all the men and women merely cyclists marking the 400th anniversary of the Bards’ death. A Malaysian writer says it’s hard to grow cycling in the country if there aren’t any races and little or no support at the club level. An Aussie driver says the equivalent of a three-foot passing law wouldn’t be necessary if they weren’t such a bunch of Neanderthals behind the wheel. Maybe they should pass a law protecting cyclists from kangaroos, too. A Chinese man is under arrest for allegedly riding his bike up to a car, taking his clothes off, and lying under it to pretend he’d been hit by the driver and demanding compensation. But can someone please tell me what being naked has to do with it? The 82-year old founder of the world’s biggest bicycle maker is now the poster boy for Taiwanese bicycling; oddly, he didn’t take up bicycling himself until he was 73. Yes, you can draw a bike from memory, but you probably can’t ride it. If you’re going to ride off with an $11,400 bike from a bike shop, make sure it has pedals on it first. And you’re not a bike rider, you’re a member of the Federali terrorist group. Update: Busted for going too slow? Or Biking While Brown in Gardena? Update: Here’s video of the incident. I wonder how many motorists are frisked or searched for weapons for a simple traffic violation? Something tells me a white, middle-aged man like me would have have been treated far differently under similar circumstances. We’ll hope it was just a mistake. On Wednesday night, a group of bike riders were on their way for a meeting with the Gardena City Manager when an apparently over-enthusiastic police officer pulled the entire group over. And ticketed them for a violation that didn’t apply under the circumstances. Representatives of the United Riders, made up of members of Los Riders and East Side Riders, were on their way to city hall with relatives of hit-and-run victim Benjamin Torres in their continuing fight for justice in the still unsolved case. As well as to discuss the issue of ghost bikes following the removal the memorial for Torres. In the absence of a bike lane or other bicycling infrastructure, they were riding in the right lane, outside the door zone — as they are legally entitled to do — when they were pulled over by a squad car on the 15400 block of South Western Avenue. According to the Los Riders Facebook page, they were told to sit on the curb while the officer waited for her Sargent to arrive with another four patrol cars in tow. All for a handful of bicyclists riding slowly on their casual cruiser bikes. Maybe too slow for the officer in question, who, after consulting with her superior, ended up citing the group for impeding traffic under CVC 22400. Yet according to the LAPD, the standard for impedance requires a minimum of five vehicles stuck behind the slower moving vehicle and unable to pass, which was not likely in this case. And it doesn’t apply on roads with two or more lanes in each direction — like Western, for instance — where a driver could simply change lanes to go around the slower vehicle. In other words, despite the presence of at least six patrol officers, including a police Sargent, they couldn’t come up with a valid violation to cite the riders with. And it’s pretty well guaranteed that those six patrol cars impeded traffic far more, and far longer, than a group of slow moving bike riders would have. Meanwhile, the riders eventually got to city hall for their meeting. And ran into Gardena police chief Ed Medrano, who promised to talk with the officers in question. No word on whether the tickets will be rescinded, however. Which brings up the question of whether the riders were really stopped by an officer who didn’t understand the law because they were riding too slow. Or because they were profiled based on their appearance and attire. But its one I wish I didn’t have to ask. Thanks to Danny Gamboa and Lynn Ingram for the heads-up. Update: The five vehicle standard in found under CVC 21656, which also notes it only apply on two-lane roads; thanks to billsd for the heads-up. Meanwhile, Streetsblog’s Sahra Sulaiman offers a detailed look at what happened. Update 2: According to my records, Gardena has had at least three bicycling fatalities since 2010, including two in the last nine months — a horrible record for a town of under 60,000 people. And all of those were hit-and-runs. They have far bigger problems than a few bicyclists riding in the traffic lane.